The mood at the Newport Moose Club last Saturday night was a combination of church supper and rock festival, as six local bands pitched in to raise over $3,000 for Andy Dickinson. Friends of the Newport man, who was paralyzed in a motorcycle accident last Thanksgiving, hugged, milled about selling 50/50 raffle tickets, and enjoyed the music. Smoke and Mirrors, a new band that includes Claremont guitarist Brian Devenger, “crammed for weeks to get ready,” said Warburton, who is also Devenger’s niece. Saturday’s show was their first official gig. Local reggae favorites Saylyn played an early afternoon set, as did Sun King. Rutland-based Vision knocked out a solid set of covers, everything from “Rockin’ in the Free World” to “Hot Blooded.” Their performance sat well with the many Harley logo-festooned patrons crowding the dance floor. D’Brotherhood, an edgy, politically charged three-piece group, dedicated an emotional rendition of an original song, “You Won’t Break Me,” to Andy. Stonewall closed the night, playing a rousing version of the Doors’ “Roadhouse Blues” for absent friend Dickerson. “It was awesome, we’re very satisfied with the way it all went,” said Warburton, who said that the money raised at the benefit (along with a few dollars raised from bake sales last December) will be used to Dickinson’s home ready for his return from the Boston hospital where he’s currently receiving treatment. Dickinson’s sister Dee told Andy about the benefit during a visit Sunday. “He was happy, but also sorry he missed the show,” says Warburton. The good news is that all the bands involved, and some others who weren’t, will do it again when Andy comes home. Anyone interested in contributing to the effort should contact Tina Warburton at 603-863-0520. I don’t envy tavern owners faced with the task of booking talent to their establishments. How do they know what their clientele want? From what I’ve gleaned, it’s a hit and miss affair where “learn from your mistakes” tends to be the operative phrase. Sophie & Zeke’s, the downtown Claremont hot spot du jour, tried everything from shoe-gazing singer-songwriters to unplugged heavy metal when they began offering music last year. For some reason, jazz, with an emphasis on crooner styles popularized by Ella Fitzgerald and Mel Torme, seems to get people moving towards, and not away, from the stage. There’s also a serious bluegrass contingent that turns out every third Friday to hear the Spiral Farm Band play. On Washington Street, the opposite’s true at Bistro Nouveau, where “solo on a stool” acoustic musicians hold sway, and not much more than a microphone requires electricity. Performers like pianist John Lovejoy and singer/guitarist Jason Cann regularly entertain appreciative diners. It’s even harder when you’re trying to fill a 700-seat room like the Claremont Opera House, which is why it was so gratifying to see a sellout last Saturday night for Bob Marley’s stand-up act. This is the third or fourth time that comedy has drawn a big crowd there. That’s encouraging news, because the next Opera House show, on Thursday, February 8 also features a very talented comedian. Robert Dubac transformed his club act into a one man show, “The Male Intellect: An Oxymoron?” I’m a long-time Dubac fan, going back to the days when he used to warm up crowds at Eagles and Jimmy Buffett concerts. When I learned he was coming to Claremont, I immediately blocked out the date. Maybe it’s cabin fever – laughter warms the body as well as the soul – but comedy seems to be the sweet spot for the COH. Hopefully, that means more funny folks like Bob Marley and Robert Dubac are on the way. What’s coming up this weekend? Thursday: Billy Rosen Jazz Quartet, Sophie & Zeke’s – There’s been a lot of different music here, but for some odd reason, this is the first time a saxophone has ever made an appearance. Rosen’s a fine guitarist, and a veteran of the Upper Valley supper club circuit. Tonight, he’s joined by Norm Yanofsky on keyboards, Jim McNutt on drums and Nick Scalera on sax. Tomorrow, another new duo – Have Blues Will Travel – stops by S&Z’s. 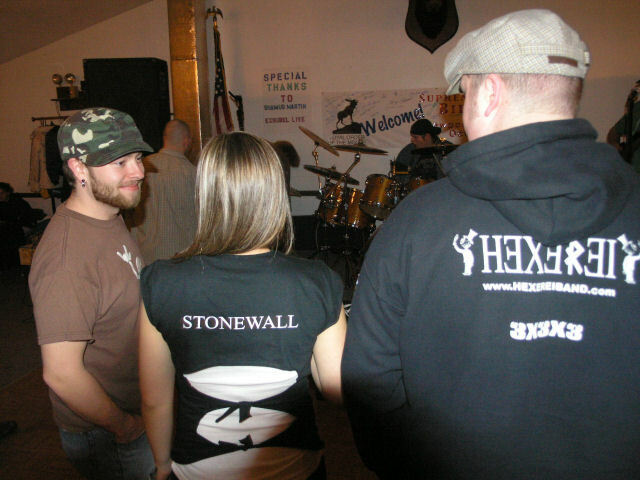 Friday: Stonewall, The Underground – Chester native Brendon Thomas started this club in a space below the music store where he worked. It’s become a magnet for area musicians, many of whom learned from Thomas (who performs live and on record as foreverinmotion). Tonight, rising stars Stonewall headline a three-band show which includes political metal from d’Brotherhood, who are kind of an anti-Hanson, and Orange Juice. Saturday: Spare Change, Salt Hill – One of my favorite bluegrass bands, led by multi-instrumentalist Joe Stallsmith of Joe’s Waterworks fame. When anyone asks me to name the one kind of music I can’t live without, it’s inevitably a combination of acoustic guitar, mandolin and fiddle, because you can’t fake any of those instruments. If you’re awaiting word on Newport’s Salt Hill Two in the old Eagle Tavern space, wait no more. Opening day is February 5. Sunday: Roger Marin, PK’s Tavern – I mentioned in my blog a couple of weeks back that Ezra Veitch, an angel of the Bellows Falls scene, was still in town. Lately, he’s mixing a Mr. Burns album while he recovers from hand surgery. He also sent word that he’d put together a quick show this weekend with Marin, the longtime Fred Eaglesmith guitarist who went solo about 18 months ago, and Adam Carroll, a Texan with the gift for weaving a story into a song. By the by, Boccelli’s February calendar is filling up – check out flyingunderradar.com for more info. Wednesday: Jason LeVasseur, New England College – This is the future of music. Not this guy, though he’s very talented, but the way he brings his music to the people. MySpace, mailing lists, independently produced records made on a shoestring with musicians who are equal parts hired guns and fellow travelers, and a ton of solo touring. The aforementioned foreverinmotion is doing it, as is LeVasseur, a Nashville-based singer/songwriter with a touch of sandpaper in his voice, and a nice balance of pop and plaintive.